In a surprise to absolutely no one, Tim Brown was elected to the College Football Hall of Fame this morning. One of the first long-form pieces we ever did on this blog was a tribute to number 81. You can re-read it here. Kevin sent out a little roundtable roundup to the BGS crew, asking for five takeaways from the spring for Irish pigskin. Here's what we noticed. Kevin. 1. ND still does not have an answer at the third wide receiver spot. On the bright side, Robby Parris, Duval Kamara, Deion Walker, and John Goodman -- as well as Shaquelle Evans -- still have the opportunity to earn significant playing time. On the other hand, none of them have yet seized the job. 2. Someone will be confused, and I hope it's not us. The pass rush in the Blue and Gold game appeared to confound and at times overwhelm the offense. I hope the we find that our defense is easily confusing, and not that our offense is easily confused. 3. While I don't think we'll see anything on the level of moving a running back to the other side of the line, the situation at linebacker remains in flux. Will Brian Smith move to one of the outside spots and gain the opportunity to make himself even more of a disruptive presence, or will he be forced to stay inside? 4. Where will Ethan Johnson play: DE or DT? Does it matter? If Ethan plays a three-technique tackle position, will he still be able to help create a pass rush, or is his size and speed best left on the outside? Will the quality of Notre Dame's interior line personnel even permit such a move? 5. The Blue and Gold Game emergence of Joe Fauria was encouraging. He is an able blocker, he seemed to have decent speed, and he caught the ball pretty well. If Fauria and/or Ragone can complement Kyle Rudolph, the possibilities for the Weis offense are exciting. Michael. A. Our secondary is good. Our safeties didn't miss any tackles (see Zibby, Bruton vs. Hawaii) and they delivered big hits to receivers across the middle. Robert Blanton was as good as advertised, Jamaris Slaughter showed some skills, and Leonard Gordon definitely surprised. Did anyone even try to throw on Darrin Walls? He played, but I don't even remember seeing him much. Probably a great sign. B. We have some talent at TE. Fauria showed he can block and catch the ball. Ragone may not be all the way back but he got open down the seam and was used as the primary receiver on a play action bootleg. That was exciting to see. And then there's Kyle Rudolph, who just does it all. Walk-on Bobby Burger, whom Weis said will definitely be in the mix come fall, didn't play. C. Randy Hart is going to put together a good DL. His track record, his style, and the young talent he has to work with make me confident of this. I expected to hear Ethan Johnson's name a few times, but it was surprising to hear Brandon Newman's name called as many times as it was. Competition, competition, competition. It sure beats the Landri-Laws-Beidatsch days where depth was pitiful. D. I like Verducci's style. I want to believe what everyone (Charlie, Verducci, Sam Young, et al.) said about improvement, but I need to see it in September. I've been critical of Paul Duncan, and it appears he's heading for a Turkovich-like transformation. It was also disappointing that Dever, Romine, and Robinson were hurt or sick and missed time. Especially the OTs who we'll need in '10. E. Lots of movement in the LB depth chart-- what does it all mean, and how will Manti's arrival affect the two-deep? This is what has me most intrigued, even moreso than the young DL. Pat. 1. Given the concerns about left tackle, it was reassuring to hear all the praise for Paul Duncan from coaches and media types all spring long. On the other hand, with likely second teamers Trevor Robinson, Taylor Dever, and, for a time, Matt Romine missing spring practice, there are still plenty of questions about OL depth. 2. Speaking of questions, there were plenty of other interesting issues we didn't get a sneak peak at during the Blue-Gold game. How James Aldridge looks at fullback will have to wait until the fall. Is the Goodman at QB just an emergency contingency or might we actually get to see his arm this fall, possibily attempting the trick plays Samardzija was never able to complete in a game? Seeing Darius Fleming at his new position of SAM 'backer will have to wait, as will seeing Kapron Lewis-Moore in action. Heck, it's possible that Fleming, KLM, Ethan Johnson, and Kerry Neal will be the front four for a majority of the downs next season and Ethan is the only one who played in the Blue-Gold game. That leads me to the next observation. 3. There is plenty of hope about the young and talented D-line, but how they will perform against opposing teams is still a question mark. Honoray coach Justin Tuck's comments (""I feel as though they're very versatile. Especially Ethan [Johnson]. 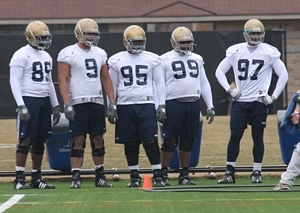 That defensive line has the opportunity to make a lot of strides.") are certainly encouraging while fellow honorary coach Bertrand Berry's ("The one place where I saw glaring need was in the endurance level, on the defensive front in particular.") highlight that there is still development needed for a line that might not have a senior in the two-deep in the fall. 4. It was fun to watch the practice clips of new coaches Alford, Hart, and Verducci. The trio were certainly not short on emotion and intensity on the practice field. Let's hope it carries over to their players this fall. 5. Except for the fact that Brian Smith won't leave the field much, I still have no idea how the linebacker rotation will play out . What happens when Darius Fleming is back from injury? Can Toryan hold down the middle 'backer spot? Where will Manti fit in? What does the future hold for Filer? Mike. (1) Offensive position battles - Heading into spring, I thought the key position battle on offense would be left tackle - would Matt Romine or Trevor Robinson challenge Duncan for the position? (While Robinson seems like a guard ill-suited for tackle, I thought the same about Turkovich heading into last year and Turkovich did well at LT.) However, Duncan seemed to lock up the position so quickly that even a healthy Robinson probably wouldn't have changed things. Instead, the real position battles on offense were at FB (prior to Aldridge's injury), 2nd TE, 3rd WR and the backup OL positions. (2) Depth issues - I was disappointed by how much effect the spring absences appeared to have. The loss of Golden Tate (baseball) and Michael Floyd (injury) reportedly slowed the offense quite a bit. Given the talent of Tate and Floyd, oI would expect their loss to be noticeable, but I would have hoped that Duval Kamara, John Goodman and Deion Walker would have softened the blow a little more. Kerry Neal's injury left the defensive line without its most experienced member - and Neal was in high school when Brady Quinn was still at ND. Darius Fleming appears to be projected as the starter at Sam, but what does that say when he hasn't played the position before and missed the entire spring? There's a number of positions where an injury could be quite costly. (3) Winning first down - Pat toyed with ways to measure defensive success on first down last year and I really think that is the key to the entire defense this year. The talent and depth in the secondary, the increased speed in the front seven and Tenuta's attacking style will give offenses fits in obvious passing downs. But we have to get there first and I'm concerned about the defense's ability to hold up between the tackles against power running teams. (4) Bert Berry's comments - Berry obviously cares about the program, so I can't imagine him making those comments regarding conditioning lightly. I placed much of the blame for the blown leads against Pitt and Syracuse on the offense, but I have to wonder now how significant a factor conditioning was in those come-from-ahead losses. (5) Recruiting - I'm not one to immediately panic because no one committed at the spring game. Still, it would have been nice to pick up a commitment or two from one of the visitors to spring practice. I can understand the recruiting effort flagging a bit during spring ball, but if that really happened then the coaching staff needs to eke out every recruiting opportunity presented by the May evaluation period. Jay. Three quotes, one play, and one picture. I. Hart's comments on the defensive line depth, and especially Ian Williams. Q: For the guys who played here last year, what's the biggest adjustment in moving from the 3-4 to the 4-3? Coach Hart: You know, I'm not sure. You'll have to talk to them. Most everybody has some form of the various defenses in their defensive package, no matter what you call it. As long as you can maintain techniques, you can line 'em up any way you want 'em. So I think the fact that we are trying to use very similar techniques and then line them up in an odd front, even front, whatever it is -- it's all basically football. As we say, it's "strike a blow, get off the block, pursue the football, and tackle." II. Sam Young's comments on Verducci (and implications vis-a-vis Latina). What does that tell us? "The improvement I'm seeing in myself and other guys on the line from Day One to now, it's phenomenal, it's unbelievable," Young said. "If we can keep up a trend like that, between working in the summer and camp in the fall, we've got a damn good shot of accomplishing what we want to do." IV. The only takeaway from the actual Spring game itself for me was the appearance of what I believe is a new route in the arsenal. On one play, Hughes motioned out of the backfield, but then ran a 5-yard crossing pattern, and Clausen (or maybe it was Crist) hit him as the #1 option. This is the only major new wrinkle, scheme-wise, that I saw. Usually a back out of the backfield who catches a ball in this offense is sitting down underneath, waiting for an outlet. This time, he ran an actual pattern. Maybe it's nothing new -- maybe it's been buried in the playbook for years -- but it definitely caught my eye. V. Charlie coaching the second half of the game from a barcalounger. Is there a third way between the sideline and the pressbox? Pete. 1. As it's been the last two years, the ultimate success of the team rests on the successes or failures of the defensive and offensive lines. One is talented but green, the other is finally mature but doesn't have the greatest of resumes. On the one hand, it's a little unnerving to rest such hopes on two brand new coaches, but on the other, the coaches are new because those issues were recognized, and they're presumably here to fix them. 2. Linebacking seems to be another area of concern. I'm very interested to see how Te'o's arrival goes, because if he's as good as advertised, the defense could look a lot different by the regular season than it does now. Not exactly pinning any hopes to that, though. 3. I have no doubts that Clausen, despite a thoroughly 'meh' spring game, will be a reliable asset during the season. If there is one thing Weis can do, it's cultivate a quarterback. 4. I'm very enthused about having several tight ends on the roster again this year. It's evident that much of Weis's flexibility when it comes to gameplanning relies on an effective tight end that can block and catch passes, and it looks like we might have a couple of those. I don't know if talented tight ends are the Rosetta Stone of the Good Weis Offense, where passes get circulated, screens develop, and points are scored, as opposed to the Bad Weis Offense, where receivers don't get open, quarterbacks get sacked, and single yards on third down are as elusive as the Sasquatch, but I can hope. 5. So help me, optimism has me in its grasp. I'm trying my damndest to shake loose, but its tentacles are so strong. With the NFL draft set to start in a little bit, I thought I'd point out a few good reads from this week pertaining to the Irish and the draft. Frank at UHND has some great stuff on all-time Irish draft steals and draft busts; Trevor Laws recounted to the Philly Inquirer his draft-day jitters from last year; and Mike Rothstein at the FWJG had a lively Q&A with David Bruton, detailing his expectations for the draft today and how everyone back home in Miamisburg, Ohio, is rooting for him. Bruton, as we know, is likely the only Irish graduate to get drafted this weekend (Terrail Lambert is probably the only other possibility, but even he's a longshot). The other candidates -- Mo Crum, Pat Kuntz, Mike Turkovich, and Asaph Schwapp -- will end up being free agents and might get a camp tryout here or there. Crum, for his part, talked about his prospects with Rothstein. Irish Insights: What's the next plan (if you don't get drafted)? Would you do the free agent thing? Would you do something else? MC: "I'd go free agent, just from talking with my coaches and people who know football, most of them seem to think that for whatever reason I didn't get the recognition or whatever but most of them think I'm good enough to play at the next level so I believe I can play at the next level. I'll just have to go a different route and whatever happens happens. As long as I get a chance to prove myself and have an opportunity, that's all I can ask for. If it doesn't work out that way, then I'll move on but I am going to 100 percent pursue football." Irish Insights: After the season was over, were you somewhat surprised you weren't invited to the NFL combine considering the career you had? MC: "I was a little shocked by that, that I didn't get an invite, that I didn't get a chance to attend. I was just shocked. I guess I wasn't supposed to be there, I just don't know. It's one of those things you can't really explain but you have to accept it and move on. Irish Insights: When you see that, is that a reality check for you? MC: "No, not really. It's a lot of things that go on that I never really understood and I just put it in that category." Irish Insights: When you're talking to teams, what do you say to them to sell yourself? MC: "For one, I tell them that as far as being on the field, that I eventually become an extension of the coaching staff on the field through leadership and being a smart player and getting the system down and helping other players on the field to know if they don't know what they are doing, our chances on the field to be successful become that much greater. I feel like I can bring that to a team and lastly, I'm a team player. I love football and just love to play the game nad be around a team. You don't have to worry any issues or problems with me and whatever team I'm with, I'll give 110 percent." Having just one guy drafted is pretty poor, but it is not an unprecedented occurrence for the Irish; if you look at the history of Notre Dame players taken, you'll see a few years with pretty low yields. The last time we had a solitary draft pick was in 2000, when Jarious Jackson was the only Irish player to hear his name called (in the seventh round, to the Broncos). In 1998, Allen Rossum walked alone (picked by the Eagles), but then you have to go all the way back to 1977 to find somebody else flying solo (running back Al Hunter, to the Seahawks). Usually, the Irish have at least a handful of guys walking across the stage. Although the number of rounds in the draft has changed (going from as high as 26 rounds in the 1940s, to the current 7-round format) and the overall number of players drafted has fluctuated, if you draw a line at the first 270 players taken, the Irish have averaged just over 5 picks per draft going back to 1967 (the first year that we have a good accounting of not just the round, but the specific selection number where a player was taken). With just Bruton getting drafted this year, and just four guys drafted the year before, I was curious how heavily "draft pick-laden" different teams were over the years for the Irish. I took a quick rack-up of draft picks, and then summed the total number of guys who were eventually drafted who were on the roster at the time, whether they were seniors or freshmen or whatever. Here's the spreadsheet. Obviously this is just a quick tally and doesn't take into account transfers, nor does it do any weighting (by draft position, class year, or anything else). But I think it still shows a correlation between a team's record, and how many draft picks it eventually produced. If I have some time, I might do some weighting and see what else shakes out. Sunday Update: David Bruton goes to the Broncos in the 4th round, the 114th pick overall in the draft, and the sixth safety taken. Monday Update: 5 ND players signed as free agents with David Grimes headed to Denver, Mike Turkovich and Asaph Schwapp joining the Dallas Cowboys, Terrail Lambert headed west to San Francisco, and Pat Kuntz staying in Indiana with the Colts. Mo Crum and Justin Brown are expected to sign with teams soon. Once again we've got a reader-submitted photo gallery from this past weekend's Blue-Gold Game. As always, thanks to those who submitted pics including Chris P., Justin F., and James C., who took the photo at the right. If anyone else has pictures of the weekend events to contribute, email them to BGS and we'll add them to the slideshow. In addition to those pics sent to us, you can find other fan photo galleries courtesy of WLO and IrishFans. On the professional side of things, there are photo galleries on UND.com, Irish Illustrated and the South Bend Tribune. If videos are your thing, Youtube is already filling up with clips from the game to complement the highlight compilation posted on UND.com. Thanks again to those who sent in pictures and links. One last thing to add, there is a new blog on the sidebar entitled "The Casual Observer" written by the sports staff of ND's student-run Observer. In addition to coverage of all ND sports, they have an excellent live blog of the Blue-Gold game for those who weren't able to attend. Check it out. Note: The following entry was written in commemoration of the 5th anniversary of the death of Pat Tillman. It has no direct connection to Notre Dame and very little to football and you may want to skip it entirely. I was raised in Tempe, Arizona, where Pat Tillman's legend first gained a foothold at Arizona State. And while our paths never crossed and I am ten years his senior, Pat Tillman became my hero. How many pro athletes do we really ever think of as heroic once we are past puberty? Thanks --JW. Pat Tillman had bigger plans. And if you wonder how big, I'd like to share with you some quotes I came across recently, the first of which was written shortly before this soldier had his first real taste of combat along the Afghanistan-Pakistan border. "I have faith in my star--that I am intended to do something in this world," he writes. "If I am mistaken--what does it matter? My life has been a pleasant one and though I should regret to leave it, it would be a regret that perhaps I should never know." The author of that quote is not Pat Tillman. The soldier who wrote those words (to his mother) was Sir Winston Churchill, arguably the greatest statesman of the 20th century. It was about a month ago that I at last picked up and decided to tackle a book that is approximately the size and mass of a package of Gold Medal flour. The tome, "Churchill: A Life", by Martin Gilbert, had been taunting me for nearly a year. I'd bought it with the best of intentions--to learn more about the widely quoted Brit-wit--but at 980 pages it was just so daunting. And there were always so many more easily digested distractions. Deadspin, for example. Thankfully, last month I found myself unemployed and in the midst of a 12-hour train ride. It was now or never. The early chapters, Churchill's childhood, were perfunctory reading at best. But once Winston turned twenty? The next five years of his life were as thrilling as any Indiana Jones film. Seriously. And as I read the words, culled from letters and books that Churchill had written about his combat experiences in what is now Pakistan, the Sudan and South Africa, a recurrring thought abided: this is Pat Tillman. Winston Churchill was a fairly privileged young man (his father had been a member of the House of Commons) who never had to leave Great Britain. He would have been prosperous and influential anyway, a member of Parliament in what was at that time the most imperial superpower the world had yet seen. Instead, Churchill begged his widowed mother to prevail upon her influential friends to get him to the front--and England in the 1890s was fighting battles on many fronts. In 1897 Churchill, then 22, wrote his mother while on a 2,000-mile rail trek from Bangalore (in southern India) to what is now the Peshawar region of Pakistan. "I have considered everything and I feel that the fact of having seen service with British troops while still a young man must give me more weight politically-- must add to my claims to be listened to, and may perhaps improve my prospects of gaining popularity with the country." The future Prime Minister of Great Britain did not experience battle from the comfort of a tea garden. "So close and critical did affairs become," Churchill wrote his grandmother following his first day in action, "I was forced to fire my revolver nine times in self-defense....I think I hit four men. At any rate, they fell." That was in Peshawar. In the Sudan, fighting the Dervishes, Churchill led two cavalry charges against men armed with spears and rifles. In one chaotic account, Churchill recalled an enemy fighter who "wounded several times, staggered towards me raising his spear. I shot him at less than a yard. He fell on the sand and lay there dead." The most incredible accounts, however, were to come from South Africa. Churchill journeyed to the front of the Boer War not as a soldier, but having retired from the military, as a war correspondent. Didn't matter. He was taken prisoner and likely would have been shot dead first had he not lost his gun while helping to save a platoon of men. He spent his 25th birthday in a prison camp (Tillman, meanwhile, spent his 25th birthday reeling from a loss to the Philadelphia Eagles and preparing for the next Sunday's loss to the New York Giants). "McNeil (the British commanding officer) ordered his men back. At that very moment the Boers opened fire with their rifles. Churchill, who had dismounted, put his foot in the stirrup. The horse, terrified at the firing, plunged wildly. He broke away and galloped madly off. Churchill was alone, dismounted, within close range of the Boers, and a mile at least from cover of any kind...He turned and ran for his life on foot from the Boer marksmen. As he ran he thought to himself, 'Here at last I take it'." Churchill, incredibly, was spared. A fellow Brit heroically risked his own life and galloped back into the fray to rescue him. As I read these accounts, my stock image of the middle-aged and pudgy world leader, bundled in an overcoat and huddling with the likes of FDR and Stalin in the last days of World War II, vanished. Suddenly Churchill was just another young soldier risking his life and, like Tillman, taking chances that his good fortune did not require him to take. "I have had some dangerous hours," wrote Churchill. "I had to play for high stakes and have been lucky to win. (But) I am so conceited I do not believe the Gods would create so potent a being as myself for so prosaic an ending." As I read on about a pale, slightly-built soldier in the 19th century, my thoughts turned to a chiseled-jawed, muscular warrior of the 21st century. Both Churchill and Tillman found themselves fighting Afghan rebels-- "Civilization is face to face with militant Mohammedanism," Churchill wrote some 107 years before Tillman's untimely death, penning them within a hundred miles or so of where Tillman would perish. But what really struck me was this recollection of Churchill's from his final day in the mountains of Peshawar: "I was nearer killed-- by a subaltern who forgot his pistol was loaded--than at any other time. It would have been an irony of fate." "You know, Pat was working on his masters in history at the time of his death," Kadi Tierney told me. Last week I phoned Tierney, the pleasant and accommodating media contact for the Pat Tillman Foundation, and asked her about this connection I'd made between Tillman and Churchill. I knew, as you do, that Tillman was a student of history and the classics. But I wondered if he'd had more than a casual relationship with the biography of Sir Winston Churchill. I wondered if the events of Churchill's life had been a prime inspiration for Tillman to detour from the wealth and fame of the NFL to become a U.S. Army Ranger. It was only two days before Pat's Run, the annual 4.2 mile (after the number, now retired, that Tillman wore as a Sun Devil) celebration of Tillman's life that this year would draw 21,000 runners. Tierney was obviously busy. Still, she promised to speak to Pat's brother, Kevin, as well as to his widow, Marie. Yesterday, Tuesday, Tierney got back to me. "You were on the right track," she said. "Pat was an avid reader of biographies of Churchill. He was someone whose life, in the course of getting his masters degree, Pat studied extensively. Pat was a great admirer of his." When Tierney asked Marie Tillman about the connection between the two men, she replied, "Pat would have been incredibly flattered by the comparison." Who knows how differently World War II might have played out had Churchill met his demise in the rugged Peshawar region, or in the sand dunes of northern Africa, or while running for his life in the Transvaal. It is worth noting that both Churchill and Tillman had one brother who served in the military at the same time. And while Churchill strode through enemy fire recklessly, like Robert Duvall in Apocalypse Now, he never suffered so much as a scratch from a bullet in two continents. His younger brother Jack was wounded in the leg, while taking appropriate cover, in his very first battle. "Nothing, not even the certain knowledge of approaching destruction, would make me turn back now, even if I could with honour," Churchill, then 23, wrote on the eve of a battle in the African desert. "But I shall come back afterwards the stronger and the wiser for my gamble. And then we will think of other and wider spheres of action." Pat Tillman died five years ago today. He died in part because he subscribed to a maxim made famous by Churchill in his later years: "Courage is rightly esteemed the first of qualities... because it is the quality which guarantees all others." "One has only to look at Nature and see how very little store she sets by life. Its sanctity is entirely a human idea. You may think of a butterfly---12 million feathers on his wing, 16,000 lenses in his eye--as beautiful. A bird thinks of it as a mouthful. Let us laugh at fate. It might please her." Some thoughts on the way. In the meantime, here's the Gary Post-Tribune's John Mutka. Update: on a livelier note, check out this wide-ranging interview from Saturday with Lou. About fifteen minutes in, he starts talking about prospects for this year's Irish squad, what it takes to win a national championship, his relationship with Urban Meyer, his thoughts on scheduling, and all kinds of other stuff. 9:00 AM. There was a star-studded cast Saturday morning on the Notre Dame football practice fields, as some 70 former Irish players in t-shirts and shorts went through tryouts and workouts for the July 25 Notre Dame Japan Bowl. Among the familiar names? Tony Rice, Bobbie Howard, Brandon Hoyte, Mike Goolsby, Jeff Burris, Ray Zellars, Tim Ruddy, Jeremy Akers, Shane Walton, Bobby Brown. The oldest candidate? Kris Haines, a senior on the '78 team. Notre Dame film/television/theatre professor Ted Mandell was all over the field, filming a documentary on the Japan Bowl experience. There were a variety of media in attendance, some following Lou Holtz (and his staff) as he went from position group to position group. All the players ran 40-yard dashes to determine speed and conditioning. The players wore shirts with the Japan Bowl logo on the front and the adidas logo on the back. After the practice session, Holtz kidded that most of the announcements coming were about food. He suggested that about 52 players would be selected today and that there would be some alternates "in case I shoot somebody!" Holtz's last comments to the squad were: "This will be one of the great experiences you will have. That's my commitment to you." At his press conference, Holtz said, "We'll ask all these guys to play five plays as hard as they can, then we'll give `em mouth-to-mouth resuscitation until we can get `em back in there." For much more on the the Notre Dame Japan Bowl, here's the homepage with all the details. The game will feature a group of Notre Dame all-stars (who tried out today) against the Japanese Senior national team on July 25th. Update: here are some photos from the tryouts care of Irish Illustrated. I'm busy putting together a collage of items and impressions from spring practice. If you have any sound bites, snippets, or video clips from the last three weeks that made you sit up and take notice, feel free to email them or post 'em in the comments. I'll try to hit the highlights and put together a little digest. In the meantime, the spring game is upon us, and I wanted to let you know that if you aren't going to the game but still want to follow along, Michael Rothstein at the FWJG will be live blogging the game over at Irish Insights. In addition, the crew over at UND.com have set up a Scrimmage Central which will feature weekend blog updates and streaming audio from the game itself. The game will feature the offense versus the defense (as opposed to splitting the team into two full squads), and thus will be using a unique "scoring system" to accumulate both offensive and defensive points. Using this system, the Hawaii Bowl would have been like 196-42. Call for Pictures. As we've done for blue-gold games past, feel free to email us your blue-gold photos from the weekend and we'll string them together into a slide show. Snap away. In another potentially positive development for the Notre Dame gameday experience, the University has appointed Michael Seamon the Director of Gameday Operations. According to the University, Seamon's role will include include "coordinating the football game-day safety, security and hospitality operations that are shared among various University units, including athletics, the Notre Dame Security Police Department, and the Office of Student Affairs." In other words, ND will have one accountable point person presumably responsible for oversight of Notre Dame security, ushers, and maybe even the relationship with South Bend police and Indiana Excise "police," and that person's name will not be Bill Kirk. Seamon said, "In my conversations with Fr. Jenkins in the past ... both he and I and everyone here is keenly aware and extremely proud of the fact that Notre Dame is very special place. It leaves an impression on people when they visit here." The most important word in the article is highlighted within: Seamon said his objective will be "to work with the various departments on campus to create a more coordinated effort on how we serve the Notre Dame community on gameday weekends." This is the first public follow-up to the March 17th report, which included 21 recommendations. That actual report may never be made public, so we do not know which of the recommendations will or will not be implemented. However, if properly executed, this might be a good first step in relieving the mounting football weekend tension among the University, its students, and guests. As spring football helps college football fans slowly recover feelings in their extremities following a long, cold, blitz-free winter, Charlie Weis took some time to revisit those tortured days following the horrific Southern Cal loss with Teddy Greenstein at the Chicago Tribune, the time when his tenure at Notre Dame was hanging by a thread that looked mighty frayed. That chat yielded some fairly interesting nuggets. While Swarbrick & Co. were weighing whether Weis should stay at Notre Dame, apparently so was Weis. Leave Notre Dame. Return to the comfort zone of an NFL coordinator's job. End the abuse, the kind that led son Charlie Jr. to skip school for three days after the Irish's home loss to Syracuse. "We talked about all that as a family, and we felt that we didn't want to leave that way," Weis said during a recent 35-minute interview with the Tribune. "That would have been the easy way out. That's not why we came here." Do I think that Weis and his family legitimately contemplated quitting and heading back to the NFL? Yes. Do I think that Notre Dame probably thought longer and harder about firing Weis than Weis and family did about resigning? Also yes. He also touched on the fact that some alumni organizations and former players felt a bit ruffled at the beginning of the Weis tenure. But on those matters, he says they weren't intentional snubs. Shortly after Weis was hired, top Notre Dame administrators, including then-athletic director Kevin White, encouraged him to focus on the team rather than his dozens of speaking requests. Weis said he had an "open avenue" for former players, but he instituted a complicated policy that was poorly communicated to monogram winners. "I do enough other things wrong on my own. But those major ones I was innocent of, even though I was perceived guilty." While I feel like Weis is doing a bit too much to cover his own rear end, I want to give him the benefit of the doubt because he's shown a willingness to be relatively upfront with his own shortcomings in the past. And our new AD appears to agree, and wants Weis (rightly so) to focus far more on the field than on ensuring he has proper glad-handing technique. Notre Dame athletic director Jack Swarbrick said that in his eight months on the job, he hasn't seen any issues — or any problems with Weis' comportment. "What I've observed is uniformly positive," he said. "He's a guy who does a million small favors, or courtesies, for people. He was one of the first people to call [women's basketball coach Muffet McGraw] after that tough loss [in the NCAA tournament]. And he reached out to call Father Jenkins after the controversy with President Obama." After asking Weis to return this season, Swarbrick told him his first priority is to win football games. "Don't focus on trying to modify people's perceptions of you," Swarbrick told him. All in all, a fairly interesting interview that shines a light from Weis's perspective on some issues he's faced in the past, as well as where he plans to go moving forward. Just a quick followup for Michael's post below, and specifically the importance of tight ends to the Weis offense. Eric Hansen in the SBT had a good piece today on the comeback of Mike Ragone. Eventually the 6-foot-5, 251-pound New Jerseyite reveals the anterior cruciate ligament tear that wiped out his entire 2008 season and opened the gate for Kyle Rudolph to leapfrog him on the depth chart also caused him to wonder if football would go away for good this time. And then the wall came down and the frustration spilled out. "I cried," he said. "So many emotions went through my mind, so I cried. I never cry. It just really hurt. It hurt more than anything I've ever experienced. Football is everything to me." His passion has halted a slide down the depth chart, with freshman All-American Rudolph the clear No. 1 option through 12 spring practices, another sophomore-to-be — Joseph Fauria — pushing hard for No. 2 and walk-on Bobby Burger making a splash. 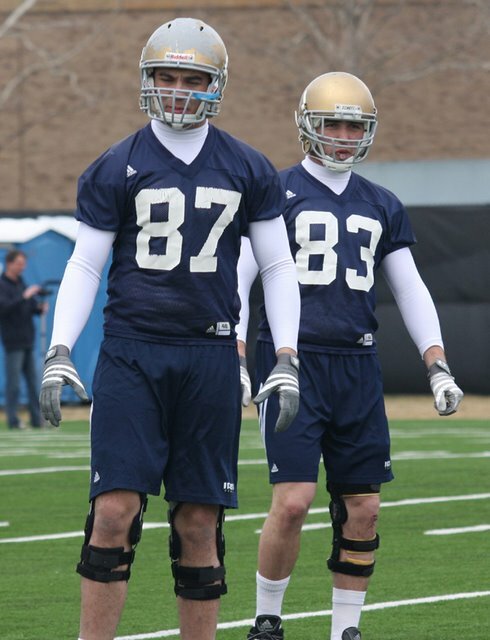 "With Ragone, he's just rallied recently," ND head coach Charlie Weis said. "I think when he first came back, he was a little bit afraid — not afraid of playing football. But having one knee (injury) and then shortly after that having another (knee) injury, I think when you first put the (pads) on and you start hitting each other, he was a little bit anxious early on. But the last couple of days have probably been the best couple of practices he's had the entire camp." One of the bases for Hansen's piece is the Weis presser of April 3rd, where Charlie talked a little bit about the return of his Jersey paisan. I went back to watch it, and one passage struck a note of synchronicity. Q: The competition and numbers at tight end, how much does that help the offense overall? Coach Weis: Sometimes, like last year, you get a little pidgeon-holed at the tight end position. So now you go from one that can play to three or four that can play. It gives you a lot more flexibility...in both formations and playcalling. Now, you're not just locked in to putting three or four wide receivers out there on every play. It opens up a whole personnel grouping and a number of things you can do [from it]. You were dealing with Rudy [Kyle Rudolph] being a freshman and Joseph [Fauria] not being ready to play yet -- as the year went on, Joseph was more ready to play -- but now with Michael [Ragone] back, and Joseph, and us not being afraid to play [Bobby Burger], it's really helped us. So here's to the continued rejuvenation of Mike Ragone, and the further development of Rudolph, Fauria, and Burger. We're going to need them this year. Late autumn, 1994. I am 28 years old and have the greatest job in the world as far as I am concerned: writing the "Inside College Football" section at Sports Illustrated. The final column is to be an awards-style roundup of the season and the previous four months' peregrinations have yielded quite a harvest. There is, for instance, this classic quote courtesy of then Texas A&M coach R.C. Slocum regarding the difficulties involved in running a clean program: "John, back in the Garden of Eden they had two people and just one rule...and they couldn't even handle that." There were just two problems. First, there was only one page of space for the column and second, my sense of glibness was a hit-or-miss affair with SI's top editors. It was like being Adam Lambert without quite that much talent, but with just as much nail polish (I know). But I will never forget what my editor, a wonderful mensch of a guy who was then in his early thirties, told me that day after my column was panned. He called me into his office and thanked me for the effort. Then he said, "You have to remember that you're not writing for the entire country here. You're writing for that small group of men down the hall. Those are the people you have to please." The top editors. Those were the people. A coterie--an oligarchy, actually--of mostly Ivy League-educated, mostly white males. The "Princeton Junction Boys" (in honor of the New Jersey Transit stop so many of them used), as it were. My editor was right, of course. But that was the twilight of an era, the last days of disco of sports print journalism. The "Print is dead" age was nearly upon us. Today, thanks to the internet, space is never an issue when covering college football (though brevity remains a wildly underrated trait--if only I could apply it) and the scope of your audience is as limitless as literacy itself. The coverage of college football is, for the most part, better for it. A sport so overflowing with passion and populism fosters an insatiable appetite among readers, one that only the web can begin to sate. It's like dining at a Texas Roadhouse and actually being able to save room for dessert. Moreover, something closer to a democracy bordering on meritocracy begins to take shape. Twenty years ago, the most difficult step toward becoming a successful journalist was landing the job at a brand-name outlet (Why else would J-School exist?). Who cared how talented a writer or reporter you were if you had no access to spread your message? Today? Launch your own site and, if it connects with readers, word-of-mouth will do the rest. Phil Knight launched the world's most successful athletic apparel brand out of the back of his car. Steve Jobs began the world's most influential digital-age company out of his garage. And Bill Simmons became the most popular sports journalist of this decade only after being unable to land a job at the Boston Globe and instead starting his own site called "The Boston Sports Guy". If it weren't for the web, Bill Simmons might still be the funniest (and most opinionated, which is saying something) bartender in Boston today. Too, there is something to be said for young people having a voice in the coverage of college sports (as if the idea itself were heresy). I recall fact-checking a story in 1991 written by Sally Jenkins. She described a wide receiver at the University of Washington as being heavily into "grunge" music. The editor changed it to "groove" music. He was UP HERE and I was down there on the masthead, but I politely stood my ground. He was dismissive, even suggesting we kill the reference. I stood my ground, having been schooled by people I worshiped such as the Ricks, Reilly and Telander, to fight for a writer's lines. The editor reiterated that no such thing as grunge existed. What could I do? This was pre-internet, so I couldn't simply tell him to Google "mudhoney and flannel". Only after I ran down to the magazine stand in the bowels of Rockefeller Center and procured an issue of Rolling Stone did he relent. It isn't that a man in his mid-forties should have been familiar with the grunge scene before the release of "Nevermind". It is simply that the prevailing mindset of the day--that people under age 25 should be obscene and not heard, or something like that--was so withering. The enthusiasm, the cheekiness of college-aged fans is certainly better represented on "EveryDayShouldBeSaturday" than it is by Beano Cook. And there's room for both. In the past, however, only the latter voice was heard. And too often the mainstream media failed/fails to provide an anti-establishment voice to college sports, whose denizens are at an age where questioning the establishment is a given. Case in point: During the second half of Saturday's Michigan State-U Conn Final Four contest, CBS play-by-play man Jim Nantz broached the topic of the alleged NCAA violations by the Huskies as exposed by the recent Yahoo! Sports investigation. While not discrediting the report, Nantz seemed to go out of his way to note that Jim Calhoun has a "spotless" record in Storrs. Considering that one of UConn's players on the floor at that moment, A.J. Price, had once been suspended for stealing a fellow student's laptop (and another, Stanley Robinson, hasn't received a grade for a class since the 2007 fall semester), Nantz might have at least acknowledged that the Yahoo! Sports story raised some valid questions as to propriety and UConn basketball. But hey, this was just a story that appeared on the internet. It wasn't as if Katie Couric had broken it. There are two reasons--besides humor--that Jon Stewart has a more devoted following among people under the age of 35 than Couric or anyone else delivering the news. Trust and candor. Stewart makes the jokes on-camera ("Mess o' potamia") that the more established anchors can only make off-camera. And they do. Stewart's on-air candor, meanwhile, gains our trust. And so it is with college football sites such as EDSBS ("Every Day Should Be Saturday"), which gives us the Fulmer Cup (a yearlong standings of miscreantism in the sport), or "Deadspin", which boasts the "Hugh Johnson Project", a fall Saturday staple where readers comment on the vast array of games in real time, transforming the site into the pigskin equivalent of "Mystery Science Theater 3000". To be fair, Sports Illustrated has never backed down from pursuing investigative pieces in college football (or any avenue of sports). And just as it is much easier to sit on your couch and say, "I could've made that catch" (which begs the question, Then why didn't you get a free ride to an FBS school?) when watching a game, it's a lot easier to opine from the safety of your own home or cubicle than it is to stand face-to-face with a player or coach and ask the difficult questions. We live in a "Guitar Hero" culture; a Wii republic, where too many equate bowling a 200 on a video screen with being a good bowler. Deadspin founder Will Leitch infamously told Bob Costas last spring, "It's hard goddamn work writing a blog." You know what else is? Writing a captivating story in 1,000 words or less (hence, I have failed on both counts here) by interviewing various and often contradictory parties, foraging for facts and drawing conclusions. Is it just a coincidence that while Bill Simmons' mailbags are freaking hilarious, his columns that appear in ESPN: The Magazine are just average? The reason so many of us veterans appear to be screaming at the wind so often is because the blogosphere places too little emphasis on accountability, on accuracy, on real talent. You want to read an outstanding college football piece? Read this 1997 story in SI by my friend Steve Rushin about Scott Frost and Nebraska. And Steve was not even on the college football beat (nor did the constraints of SI allow him to make any wiener jokes...though God knows he often tried to slip one past). Every score, every coach's record, even a link giving you the outcomes of the misnomered "Kickoff Classics". This should be the first site anyone covering or interested in college football should bookmark. Founder Jay Christensen spent some two decades at the Los Angeles Times, but his legacy should be this outstanding site, which plucks the most newsworthy stories from around the country while also providing its own original items. Daily dosage highly recommended. And, perhaps because he is old enough to remember the bicentennial, Jay's items are refreshingly free of profanity and the "Anyone who is successful must be a phony" attitude. Having worked there for nearly 15 years, I'm intrigued by the manner in which the site (and its writers) has usurped the magazine in the public consciousness. Austin Murphy has been covering college football for the main mag for more than two decades, and there is no more universally-liked writer in the sport (he also happens to be immune to the aging process...damn him!). But Stewart Mandel has ambitiously claimed the web as his turf and has endeavored to become as knowledgeable as anyone on college football's byzantine ways, from the BCS to the fact that the Big Ten is comprised of eleven teams. Stewart's the smart kid in class, and he prides himself on that. It shows in the work. Want to know who led the nation in rushing offense last season (Navy) or who finished last in passing offense (Army)? Visit this site, find the "statistics" link for football, and dig all you want. Matt Hinton and a small staff of contributors serve as a digital version of the Times Square ticker, keeping you up to date on the newsworthy and the bizarre, which often find themselves overlapping. Today, for instance, the site had an item concerning the position switch of Demetrius Jones' to linebacker at Cincinnati (how much more can this kid take?). This unabashedly Florida-centric site is crude and funny, with inspired bits such as the aforementioned "Fulmer Cup" and "Mustache Wednesday" earning it a devoted fan base akin to that of the "Daily Show". 8) Deadspin.com, "The Hugh Johnson Project"
Remember how you and your friends would watch a game in your dorm room and mock the announcers or the players with the weird names (Elvis Peacock?!?). Well, imagine if all the other idiots in all the dorm rooms all over the country were doing the same thing? And if someone could somehow filter all the remarks so that only the funny ones made it through? We welcome you to Hugh, also known as the worst thing ever to happen to Pam Ward. The New York Times gets out in front of the digital age with a blog of its own that is updated about half a dozen times daily. Writers such as Pete Thamel and Thayer Evans are that rare breed in this age who both go out and report their own stories (much to the chagrin of Mack Brown) while also writing a fairly popular blog. Like The Wiz of Odds and Dr. Saturday, this site acts as a terrific filter for absorbing all the news that's out there and providing it to you in a less daunting fashion. If you know that the A-11 is neither the latest, greatest innovation in steak sauce nor the conference of the Rhode Island Rams, this site may be for you. If you care to learn the intricacies of how the A-11 is run, this site will keep you enthralled for hours. Have to admit that I'm partial to this site because, like me, it does not want to see a playoff in college football. Before you condemn us, look who else is part of our coalition: Chuck Klosterman, Mike Greenberg and Megan Fox (okay, I'm just guessing on that last name). This is a many-layered topic, of course. For instance, where are the boundaries drawn? If West Virginia head coach Bill Stewart can Twitter us about having thrown his kickers out of a team meeting (ooh, tough guy), then why can't a blogger "friend" that kicker on Facebook and ask him what really happened without requesting an interview through the sports information director? Or, how do sports information directors define who warrants a press box credential? After all, as with parenting, journalism is not a vocation that requires a license. Does a beat writer from a newspaper with a circulation of 20,000 readers deserve a credential over a blogger with five times that many (not that the blogger would request one on most occasions, but what if he or she did?). And should the NCAA have the right to prohibit live blogging during a game? You might as well order Google to stop mapping the planet. This much I do know. Fifteen years later, the "Inside College Football" section of SI is well-written, meticulously edited, fact-checked and copy-edited. But the earliest you'll ever read it is five days after Saturday's games. In terms of 21st century college football coverage, it may as well be written on papyrus. There's a lot of great video coverage of spring practice this year; more than I ever remember. In addition to the usual outlets of Irish Eyes, Irish Illustrated, and Blue and Gold, UND.com has been posting the full versions of interviews. One new bookmark I wanted to pass along is the video index link for Irish Illustrated, hosted on Yahoo. This is a great, all-in-one reference you can use to get caught up on the highlights of the day, with three-to-four-minute excerpts of all the interviews and practice sessions. I'm enjoying it. I hope you do too. 9:07am 4/3 - Just split from staff meeting... It's already day 4, spring ball is rolling along! Really, really fired up about this thing right now!! 2:40pm 3/29 - Really jacked Coach Floyd is staying!! He's the best hoops coach in the history of SC and it's awesome he's remaining a Trojan!!!! 2:08pm 3/23 - Loved the energy and excitement out on the field today... 1 down, 14 to go... one step at a time... always competing! 8:26am 3/31 - Will Ferrell Twitter? Will he?? (get it?? it's a play on words...) Keep competing, let's turn him into a tweed! 7:08am 2/23 - The new baby is awesome and he said he'll be ready to compete in the spring!!! Picture coming tomorrow!! 6:25am 4/4 - High Fives Everywhere!! Go Gophers! 6:45pm 3/31 - Another great practice in today! We were in full pads and the guys really competed! 7:08am 3/30 - Players Play- TOUGH Players Win!!!!!! 2:34 pm 3/24 - WINNING ON AND OFF THE FIELD EACH AND EVERY DAY IS WHAT CREATES A CHAMPION! 10:01am 3/26 - Vince Vaughn is a big Gopher football fan!! Other coaches are jumping on the twitterwagon: UM_CoachRod, coachsark, and even coachronzook. 6:59am 4/4 - Scrimmaged for 47 plays. Some good, some bad. Heading in to watch the tape. 3:26pm 4/1 - Lots of hitting in practice. Very competitive. I'm pretty jacked about the use of "competitive," but where are the exclamation points? Come on, coach. 6:21am 4/1 - Spring practice #8 this afternoon, working on short yardage & red zone. Go IRISH! We finally come across the sole exclamation point on Charlie's twitter feed, and the tweet ends with some Play4brew-worthy ALLCAPS. Nice to see the potential is there, but coach needs to work on his twitter suddenness. What time is it? It’s Competition 10:00 a.m.! My favorite hour of the morning! Really JACKED!!! Did you catch Oscar-nominee Jon Bon JOVI on Jimmy Fallon?? Great actor and Irish fan! Watching a great flick right now – Glengarry Glen Ross! Loving Alec Baldwin’s speech! But if I gave it, ABC would stand for Always Be COMPETING!! Coach Hart is WIRED FOR SOUND. He has great IRISH ENERGY!! Really, really psyched about Jeff Jackson and his team!! Going all the way next year!!! And with Coach BREY! Pete and Compete were in a boat! Pete fell out! Who’s left??? Sam Young is one BIG MUCHACHO!! Really, really fired up about this championship micturation I just had!! Have you guys been reading Kevin’s posts?? Really pumped to see the new bloggers compete!!! Got a text from BRADY QUINN! He is really competing over there in Cleveland!! If you have any Carroll-esque tweets Charlie can use, feel free to post them in the comments. In addition to the daily drumbeat of reports coming out of Spring practice, here's a trio of national stories covering the Irish that came out this week. 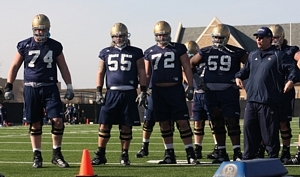 Matt Hayes of The Sporting News talks about the spirited practices this spring in South Bend. "In the three years I've been here," said Notre Dame quarterback Jimmy Clausen, "I've never seen it like this." This is far from your typical spring drills across the college football landscape. Spring is a time for young guys to make a move and veterans to sharpen skills and not get hurt. Yet there was Notre Dame, six practices into spring drills -- and only the third in pads -- banging and brawling for their ever-loving football lives. Play by play, position by position. "We saw what we could be that last time we stepped on the field," said guard Eric Olsen. "That kind of shook up everyone; made them realize we have to play with that intensity every time out." Andy Staples at SI goes over prospects for the Irish defense. Weis stopped the drill, but he didn't discipline the senior. Instead, he got in the freshman's ear hole. "You're never going to make it around here if you let that happen," Weis said later. "Not that I'm looking to instigate, but at the same time, it was a perfect coaching point for him. I was saying, 'You're going to have my blessing in that situation. ... Don't count on [junior linebacker] Brian Smith to come to the rescue. Stand up and defend yourself.'" And finally, ESPN's Ivan Maisel works up a insightful profile of Charlie, the result of an all-access, behind-the-scenes week spent shadowing the big man through meetings and practices. It's a long read, and well worth it. The Gug's staff rooms are smaller than those in most football buildings these days. Behind Weis, there are two cabinets filled with computer and video equipment. The whir of the computer fans deadens any other ambient noise. The wooden window blinds, a rich brown to match the cabinets, are fully drawn. The glow of gray light seeps in at the edges. Weis looked to his immediate left, where the new line coach, Frank Verducci, sat. On Tuesday, Verducci had sent a four-page e-mail to Weis and each of the linemen, breaking down their play. "I really like the e-mail you sent," Weis said. "It called them out, good and bad." After last season, Weis asked for the offensive and defensive averages of the 10 teams that played in the BCS games, plus Cotton Bowl participants Ole Miss and Texas Tech. "If the goal is to be a BCS team," Weis reasoned, "then that's what we should be doing." Plenty of good tidbits buried in each of those articles. Eons ago -- well, way back at the end of the 2006 season -- when Charlie Weis had an impressive 19-6 record and two BCS berths already under his belt, we examined how his offense had evolved in that short two-year span, and how it might continue to progress given the new talent recruited on offense. Fast-forward to the present: the offense seems to have lost its way, and has yet to recover its imaginative spirit from those first two years. In fact, it's gradually devolved into a primitive, generic version of that efficient, high-powered unit that shredded defenses in 2005 and 2006. Four years and change have passed since Weis was first introduced as the head coach. Supposedly nothing has changed -- philosophically speaking. But the declining performance on the field tells a different story. A quick glance at the distribution of packages utilized tells the story of the offense's devolution. Packages are listed from heaviest (more tight ends) to lightest (more wide receivers). The 3-WR set Half has been swallowing up the offense's diversity since the end of the 2005 season. Irish fans have noticed, and you've probably seen complaints (or voiced them yourself) that the creativity and imagination of the offense seems to be missing. There is certainly some truth in that. When an offense uses one personnel grouping 62% of the time, it's simply less imaginative because so much of it is the same. There really are only a finite number of ways to deploy three wide receivers, a tight end, and a halfback. Furthermore, the offense appears stale because a limited number of plays are run from a core group of formations within that grouping, rather than running a multitude of plays from a few formations. Let's contrast this situation with 2005. Back then, Half was only used 37% of the time. The Irish threw the ball from Half more often (71% compared to 66% last year), but Weis employed it more as a hurry-up device, both when the Irish were behind or simply to throw the defense a curveball, and in obvious passing situations. It was a situational personnel grouping instead of a staple. 3 receivers, a tight end, and a halfback. Last year, however, Half was the base offense. Of course, the reason why it became the base offense was the fact that we had only one viable tight end for much of the year: Mike Ragone went down with a knee injury during fall camp; Will Yeatman was suspended for an alcohol-related offense; Luke Schmidt was sitting out because of multiple concussions; Konrad Reuland had transferred to Stanford; and Paddy Mullen had long ago moved to defensive line to shore up recruiting misses. True freshman Kyle Rudolph was the only tight end in the rotation for much of the year, with fellow freshman Joseph Fauria finally getting in the mix towards the end of the season. The tight end position is what gives the Weis offense its flexibility and diversity; with only one, Rudolph, the offense was severely limited. This sameness eventually put the Irish in poor situations on the field in 2008, especially against top-five defenses like USC and Boston College, where the Irish failed to even reach the red zone. Opponents could spend the majority of their time game-planning for Half and Regular formations, and the lack of tight ends prevented Weis from being more creative with the offense. Two of those three are levels that haven't been matched since; only the Golden Tate 48-yard touchdown and the 29-yard heave to Rudolph in the Hawaii Bowl pushed the average for Two Tites in 2008 to an incredible 8.6 yards per play. However, it's worth noting that the Irish only called 12 plays all year from Two Tites, compared to 88 in 2005. "[Last year] we couldn't do what we needed to do, we couldn't use certain packages with multiple tight ends because we only had one. The more guys we have at that position, the better we are. We have three guys right behind Rudolph that really can play some ball and allow us to do more things." With Rudolph, Ragone, Fauria, transfer Bobby Burger, and incoming freshmen Tyler Eifert and Jake Golic, the tight end depth is beginning to look more promising again. Their development, and in particular, Ragone's health, will play a major role in helping the offense diversify its attack, and will force defenses to spend extra time game-planning for the full variety of looks that Charlie's offense can put forth. Once tight ends became scarce, the diversity of personnel groupings within a game all but vanished, as can be seen in the distribution below. After Yeatman disappeared, the Irish used Half over half the time in every game until USC. Tied very tightly to the lack of overall diversity in the offense is the homogeneity of personnel within a single offensive series. Although this tedium was rife through the entirety of many games in 2008, we can see it especially in an examination of several opening drives. If we look at the first drive of games in 2008, after Yeatman's suspension following the Michigan State loss, the Irish used only one personnel grouping against Purdue, UNC, Wash, Navy, and BC: Half. In the Stanford and Pitt games, the Irish subbed a short yardage grouping on a 4th & 1 and 3rd & 1, respectively. Against Syracuse and USC, the Irish used just two personnel groupings on their two opening drives (both went three-and-out). However, in the Hawaii Bowl, the Irish used four different personnel groupings on their opening drive. That, of course, is Charlie Weis football. The Irish badly need to restore such diversity in each offensive series. Defenses must be pressured to adjust constantly throughout a series to the offense's personnel groupings. Defenses should be shuffling personnel on and off the field, and they need to be forced to consider and think, rather than just react (Who's on the field? What are their tendencies? What did I see in film study?). Last year, Weis and the offense allowed defenses to find their groove, and never forced them out of their comfort zone. That can't happen in 2009. The decline of overall offensive production can also be clearly linked to a decrease in production from the Regular personnel grouping, which was the second most popular grouping (21.6%) in 2008. Regular places two receivers, a tight end, halfback, and fullback onto the field. Despite its prevalent use, the Irish failed to meet two basic offensive benchmarks: they were short of four yards per carry and failed to achieve seven yards per pass attempt. Looking back, it's hard to believe that the Irish averaged over ten yards per pass attempt in 2005, but it's no typo. Fourteen times that year the offense completed a pass out of Regular for 20+ yards, and five of those went for 40+ yards. Secondaries were not nearly as kind to the offense in 2008: the Irish completed only four passes all year that went for more than 15 yards, with three of those coming against Hawaii. Likewise, the poor average in 2006 resulted from the same lack of long passes: only one pass play of 20+ yards all year from Regular. It's worth noting, though, that Regular was used less frequently in 2006 once Asaph Schwapp suffered a season-ending knee injury. For the season, the run-pass ratio out of Regular was a heavily-tilted 64-36, whereas in prior years the Irish showed a slight preference in passing the ball in 2005 (54-46) and 2006 (51-49). Teams loaded up against the run when they saw Schwapp and Aldridge, and the Irish rarely took any play-action shots until the bowl game against Hawaii. In fact, Clausen entered the bowl game having completed just six of 24 play action passes for a modest 53 yards. The 69-yarder to Tate is a great example of the possibilities of passing out of Regular; the Warriors cheated a safety into the box, Clausen faked the hand-off, and the cornerback, with no deep help, was toast. We need more of that in 2009. The third issue with Regular was the horrifically inept toss play, which constituted 15% of the Regular rushing attack. The toss play sadly averaged 1.6 yards per carry on 18 chances, and on ten of those carries, the play was stopped for no gain or lost yardage. The best two tosses? Aldridge picked up 17 yards against Purdue, and Jonas Gray had a ten-yard run in garbage time against Washington. The other 16 attempts managed a total of one yard. Without an effective toss play, and for that matter, without a decent outside zone run (5 attempts) from this grouping, the Irish were very limited in how they could attack a defense on the ground. Schwapp's sluggish pro day results provided further evidence of why the Irish had trouble creating gaps on the perimeter of the defense -- their lead blocker couldn't get out there. Whether the potential dual-back Aldridge, Steve Paskorz, or even Burger (his role has yet to be clarified) can do better remains to be seen. Aldridge should have the foot speed to get to the perimeter, which Schwapp didn't; the question is, can he block? Aldridge is also a much more reliable runner between the tackles, and likely more of a threat to catch a pass. Furthermore, as Weis hinted at, Aldridge at fullback would also allow Weis to use Armando Allen as a receiver out of the backfield. With Hughes or Allen as the tailback, and Aldridge at fullback, the Irish should be a more diversified running team from Regular, and defenses will always have to remain vigilant for a screen pass (or even the double screen pass). Weis called a screen pass for Aldridge less than 1% of the time he was in the game as a Regular halfback; for Hughes, it was 5%; and, for Allen, it was 20% of the time. In sum, Weis cannot afford to allow Regular to be as one-dimensional as it was last year; he should return to making defenses account for every offensive player in the huddle, and force them to defend every inch of the field. As mentioned above, the lack of tight ends clearly limited the offense's creativity and production. Nowhere is this more evident than with Detroit, which utilizes two receivers, two tight ends, and a running back. In Detroit, that extra tight end allows an offense more flexibility than having a fullback or a third wide receiver: he can be lined up in the backfield, flexed out wide, on the line of scrimmage, or on the outside shoulder of the other tight end. Additionally, the match-up of a linebacker on a tight end can often favor the tight end, especially if one has recruited tight ends as well as the Irish have in recent years. "The nickel player nowadays is...playing about half the time, so he's considered a specialist. He's working on being a nickelback. My contention is the match-up that you get with an additional tight end against a normal safety or normal linebacker is really more advantageous than what you get by deploying your third wide receiver in the game and having defenses put their specialty player in." As we saw with Regular, production from Detroit has gone down since 2005, although for different reasons. While the issue with Regular has been its predictability, lack of big play capability, and inability to force defenses to account for every player, Detroit has suffered from a shortage of healthy tight ends on the roster. When we talk about "lack of creativity" in the offense, much of this can be traced back to the disappearance of Detroit over the last two years (as well as other multiple-TE packages). Lack of misdirection plays has been noticeable; but, most, if not all, of the offense's bootlegs (a staple misdirection play) are run with at least two tight ends, something we simply didn't have. Another misdirection is the counter run; these averaged 8.7 yards per carry in 2005 and 5.5 yards per carry in 2006, while all but disappearing in 2008. Another missing piece has been the wham-trap play, which Weis had predominantly used with an extra tight end; again, nearly non-existent in 2008. The importance of Detroit to Weis is clearly evident in how he tried to bring it back late in the season against USC, albeit with Trevor Robinson as the second tight end, and then against Hawaii with Joseph Fauria. In those games, Weis called a play-action bootleg for the first time since the San Diego State game, a wham-trap play, and play-action off the wham. These were relatively small wrinkles in the offense, but important ones nonetheless. The decline of Detroit explains the last two-thirds of the season, but it raises a question about the first three games, when Yeatman was still a factor: if the 2-TE packages are the missing link, why wasn't the offense more impressive against SDSU, UM, and MSU? Inc 4: Clausen throws a nice ball down the seam to Rudolph, but the defender makes a terrific play to force an incompletion. The bad news: there is no glossing over the fact that the run game was awful out of Detroit, no matter what the Irish tried. Robert Hughes was the primary back in this personnel grouping, and Weis tried to pound it with him in the first three games. Twelve times the Irish trotted Detroit personnel onto the field for a first & ten, and the Irish ran all twelve times, picking up just 36 yards. Worse yet, half of those yards came on one misdirection play. That's 11 carries, 18 yards, for those of you scoring at home. Schematics are important, but they're worthless without fundamentals. In every personnel grouping except for Half, rushing numbers have dropped since 2005. And that makes sense-- Dan Stevenson and Mark Levoir, both now in the NFL, were replaced by Bob Morton (not in the NFL) and Sam Young (a true freshman); in 2007, we replaced nearly everyone else with brand-new starters. The importance of OL starting experience was covered by Pat back in August 2008, and it's definitely worth another look. Assuming that Paul Duncan reclaims the left tackle spot, the Irish would have 97 returning starts at offensive line heading into the 2009 season. For all of the items discussed above, the impact of the offensive line cannot be underestimated. Unfortunately, line play is also the hardest to measure: we simply do not have the exact knowledge of assignments against different defensive alignments, nor do we know the line calls. Whereas formations, receiver routes, running plays, and personnel groupings are easier to discern, OL play is a lot more difficult to assess. But Frank Verducci's arrival in South Bend is confirmation that Weis saw the need for change. "He's a technician. For me, that's a good thing, because I think I've been lacking in my technique, and it's something I've needed to work on. It's a different perspective. He brings a lot of things to the table that I haven't heard before, that the guys haven't heard before." While the prospect of a three-year starter not having his technique down is alarming, in a way it's also potentially reassuring. For one, it finally sheds light on what might have vexed the line the last two years. And if there are techniques that the Irish line were not taught, and Verducci is providing that instruction, perhaps the gap between potential and performance can finally be narrowed. Who will emerge as the second TE? Who can emerge as a third TE? Can the offense regain its big play capability-- both on the ground and in the air-- from 2005? Can Aldridge help Regular become a more productive and less predictable personnel grouping? Can Verducci coach up the offensive line to play more like it did in 2005, and hopefully transcend even that? Keep an eye on these things during spring football, but realize that answers are temporary for now. It's September that counts. ND Appoints a "Director of Gameday Operations"